Super rookie who was already in CMLL at age 20. Signed by WWF in 1998 when that promotion wanted to create a light heavyweight division. WWF planned to use him as an unmasked wrestler, so Aguila dropped his mask to Ultimo Guerrero before leaving the promotion. The WWF division never took off, but Aguila stuck with the US promotion for many years under a couple of different gimmicks, usually as an enhancement talent. Returned to Mexico full time around 2002, spending most of his time in AAA, including another run in a US promotion as part of AAA's X-Cup team. Jumped back to CMLL in 2005, quickly becoming a part of Perro Aguayo Jr.'s popular rudo Perros del Mal group. 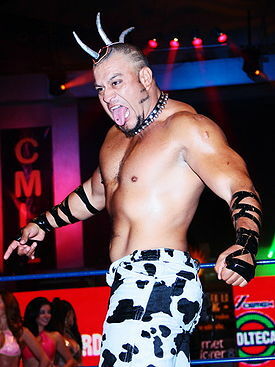 Aguila was part of the group who left CMLL to form Perros del Mal as a regular promotion. In 2010, with Perros del Mal talking to AAA about joining with that promotion, Aguila gave his notice and returned to CMLL. Aguila was introduced as a member of The Invasors, ex-AAA and Indepedent wrestlers working together (as rudos) to prove they were as good as CMLL luchadors. Aguila's still a talented wrestler, and a forerunner of the style the masked tecnicos are using in CMLL now. In his last CMLL run, especially near the end, Aguila looked great in the ring. He's looked out of shape on this run, and often wrestled in a heavy vest to hide his size. This page was last edited on 26 September 2018, at 22:41.